If you ar e hiking, make sure the time of day you choose to hike with your dog is appropriate temperature-wise. Even if you hike regularly hike with your dog and they are used to that type of rigorous exercise, in this hot weather they could succumb to heat exhaustion. Yes we want our fur babies with us on our hikes, but sometimes it is better and safer to leave your dog at home. Dogs are much more susceptible to heat stroke than humans. Dogs’ only sweat glands are on their feet. 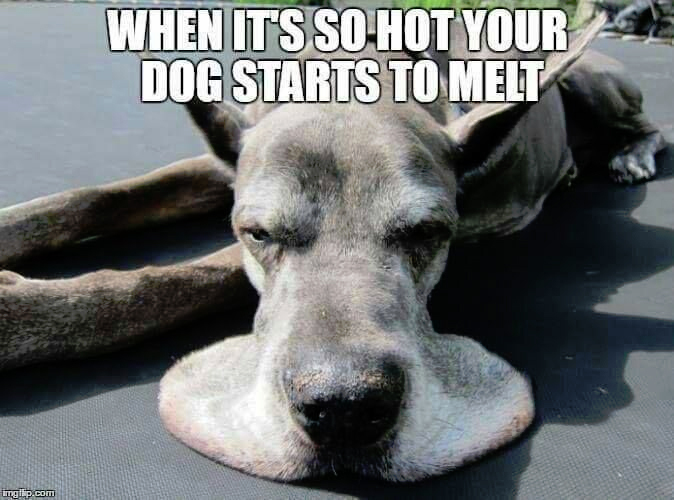 If the ground is too hot for your hand, it’s too hot for your dog’s paws. Move your pet into the shade and apply cool, not cold, water all over its body to gradually lower its body temperature. Apply ice packs or cold towels only to your pet’s head, neck and chest. Let your pet drink small amounts of cool water or lick ice cubes. Take your pet directly to a veterinarian; it could save your pet’s life. Dogs can die of heat stroke.